Market breadth continued to remain weak with 1,842 losers and 794 gainers on the BSE. Benchmark share indices extended losses for the fifth straight day to end at their lowest closing levels in 2015 on concerns of foreign fund outflows after robust US jobs data raised hopes that the US Fed may hike interest sooner than expected. Further, investors also remained cautious ahead of CAD data due later today while the ongoing Greek debt crises and decline in the Rupee also weighed on sentiment. 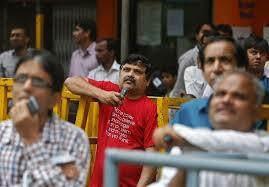 The 30-share Sensex ended down 245 points at 26,523 and the 50-share Nifty ended down 71 points at 8,044. Foreign institutional investors were net sellers to the tune of Rs 551 crore on Friday, as per BSE data. The rupee was trading down at 64.05 against the dollar on the back of higher dollar demand from banks and importers. All sectoral indices on the BSE were ended lower with BSE Consumer Durables and Metal indices leading the decline, down over 1.7% each. Vedanta ended down 3% after, its subsidiary and one of the largest independent oil and gas exploration and production companies in India, Cairn India dropped over 3% on further decline in crude oil prices. Tata Motors slipped 1.6% as the slowdown in Chinese markets is likely to hit its revenue from its luxury brand JLR. Index heavyweight Reliance Industries ended over 2% lower on further decline in crude prices. On Friday, OPEC agreed to keep the production target of 30 million barrels of oil per day unchanged which is likely to add to the further decline in the oil prices due to oversupply glut. Sun Pharma ended down 2.2% on concerns over profitability post the acquisition of Ranbaxy. Financials continued to witness profit taking on concerns that further rate cuts could be delayed after the RBI raised its inflation forecast for January 2016. HDFC, HDFC Bank and SBI ended down over 1-1.8% each. Among other shares, Eros zoomed 12% on reports of delisting buzz. SpiceJet rose 2.5% after chairman and main promoter Ajay Singh has decided to infuse capital for fleet expansion. Drug maker Wockhardt dipped over 4% after the company recalled over 200 bottles of Captopril tablets, used in treatment of blood pressure, and Clarithromycin antibiotic tablets manufactured in the US because of deviations in current good manufacturing practice norms stated by US Food and Drug Administration (FDA). Sun TV has cracked nearly 22% on reports that the Ministry of Home Affairs (MHA) has struck down the proposal by the Information and Broadcasting (I&B) Ministry for giving security clearance to 33 television channels of Sun TV Network. Opto Circuits gained over 5% after the company announced that its US-based group firm Cardiac Science Corporation (CSC) won a case against Zoll Medical Corporation over its patented wearable defibrillator technology. Shares of NIIT gained nearly 1% after the company said that it has been awarded five to ten-year contrat to provide managed training services to Statoil, ASA. Statoil ASA is a multinational oil and gas company with headquarters located at Stavanger, Norway. Shares of Bank of Baroda declined over 3% on the Bombay Stock Exchange (BSE) after the bank revised its rate of interest payable on term deposits. In the broader markets the BSE Midcap and Smallcap indices ended down 1.4-1.5% each.